The Search Engine for your online shopping, find The Best Offer comparing Amazon and Ebay! 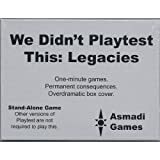 We Didn't Playtest This: Legacies has all the pure chaos of Playtest, with the ability to write on cards and change them forever! We Didn't Playtest This: Legacies contains 50 all new cards, plus four bonus packs that you open once you meet certain quest goals! And you know you like quests. What's new about Legacies cards (compared to original We Didn't Playtest This at All cards) is they contain a slot for Owner and a picture. When you win a game of Playtest: Legacies, you claim ownership of the last card you played, by writing your name in the Owner box. FOREVER. If you own a card, you ignore it if it ever tells you that you lose. Some cards may have additional bonus effects for ownership! Copyright © 2019 All rights reservered.